The Portland Timbers owner Merritt Paulson, center, son of the former Treasury secretary Henry Paulson, met fans before a match against F.C. Dallas. 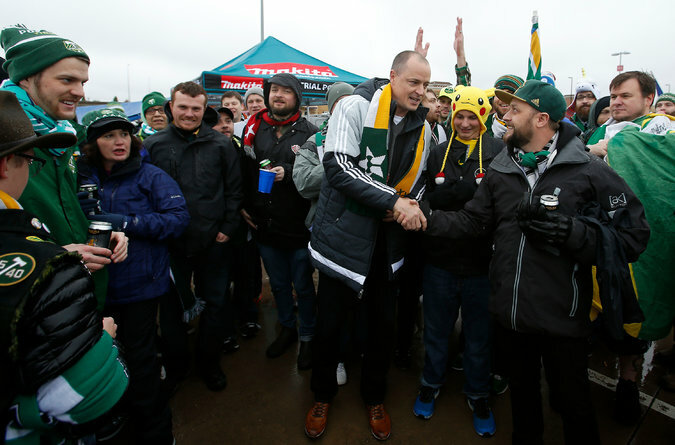 When Merritt Paulson watches his Portland Timbers play, he is always joined in the owner’s box by the team’s general manager, Gavin Wilkinson. But when the Timbers take on the Columbus Crew on Sunday in Major League Soccer’s championship game, the M.L.S. Cup, Paulson will have extra company: his father, Henry, a former Treasury secretary and a former chairman of Goldman Sachs, and the rest of his family. Henry Paulson, who spends much of his time these days working at an institute he started after he left government, is no stranger to the Timbers and his son’s work: He helped him buy the club in 2008 and pay the $30 million fee to enter M.L.S. in 2011.